AS Monaco plan to legally challenge the order which would end their tax exemption status by forcing them to move their headquarters to France. The club also say the French Football Federation has demanded an "outrageous" payment of 200 million euros (£168m) for their base to remain in Monaco. The FFF has rejected the claim, insisting Monaco made the offer. Monaco are set for promotion to the top flight, and attract many top players as foreigners do not pay income tax there. "ASM FC [Monaco], after consultation with its legal counsel, has decided that it has no other choice but to bring legal action in order to obtain a judicial resolution of the dispute,' the club said in a statement on Sunday. "As part of this legal action, ASM FC will be seeking the annulment of the LFP's [French League's] decision of 21 March requiring the club to establish its headquarters in France, as well as a claim for damages from the LFP as compensation for financial and commercial losses suffered as a result of that decision." 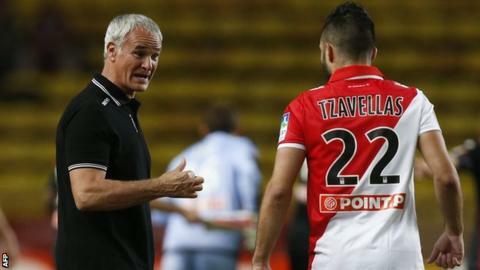 Former Chelsea manager Claudio Ranieri's side currently top the French second division, but missed the opportunity to end a two-year absence from Ligue 1 this weekend when they were defeated by Caen. They lead second-placed Nantes, who have a game in hand, by five points, but will clinch one of the three promotion places if they beat Nimes next Saturday, regardless of other results. Monaco's dispute with the French footballing authorities came after they were ordered to relocate by the start of June 2014. If they made the switch, the club would be liable to pay tax in France. A major cause for the action is the proposed 75% income tax rate on high earners, a regulation that would put Monaco at a major advantage compared to their French league rivals when it comes to the overall cost of their players' wage packets - if they remain based outside France. Despite being in Ligue 2, they have invested heavily since Russian billionaire Dmitry Rybolovlev bought a majority stake in December 2011. They have further been linked with making big-money summer moves for star names such as Chelsea midfielder Frank Lampard, as well as Manchester City pair Samir Nasri and Carlos Tevez. In regards to the demand to pay 200 million euros, Monaco said French federation president Noel Le Graet "acting on behalf of both the FFF and the LFP" made the offer at a meeting in Paris last Friday between himself and Rybolovlev. "The position of the club is very clear: ASM FC considers that such a demand is not only outrageous but also totally unacceptable," the club added. The FFF has responded with a statement of their own, rejecting the reports about Le Graet's role and further revealing that all parties had agreed to "reconvene during the week of 20 May" to discuss the matter further.